Don't skimp on the fun stuff when it's just the two of you for dinner. These Cheesy Baked Potatoes for two are ready to serve in a mere 15 minutes. Scrub potatoes thoroughly with brush; pat dry. Prick potatoes with fork. Place on microwaveable plate. Microwave on HIGH 6 to 8 min. or until potatoes are tender. 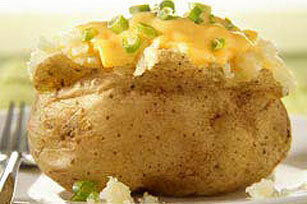 Cut crosswise slit in top of each potato; squeeze potato from both ends to open potato. Top with 2% Milk Singles. Microwave 1 min. or until 2% Milk Singles are melted. Sprinkle with onions. Prepare as directed. Top each potato with 1/4 cup each chopped OSCAR MAYER Ham and chopped cooked broccoli. Microwave an additional 30 sec. or until heated through. Microwave 1 potato 4 to 6 min. or until tender. Continue as directed, using one 2% Milk Singles and 1 tsp. sliced green onions. Makes 1 serving. Prepare as directed, using KRAFT 2% Milk Sharp Cheddar Singles.